I decided to write this because I ran into a space problem while trying to upgrade a HANA test system. Of course, it isn’t a certified appliance, but I had to move the data and log files to another mount point to free up enough space to complete the upgrade. Moving data files to a different mount point is a common procedure for many databases, but typically isn’t an issue with HANA’s appliance model. HANA has a very specific hardware configuration with the persistent mount point being 4 times RAM. The introduction of the Tailored Datacenter Integration (TDI) may warrant this process a little more often. I’ve outlined the steps below to move the $(DIR_GLOBAL)/hdb/data and $(DIR_GLOBAL)/hdb/log directories to a different location. 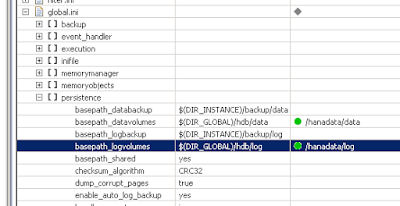 MAKE BACKUP OF DATABASE BEFORE DOING ANYTHING. I suggest to copy, instead of move, in case there are any problems. 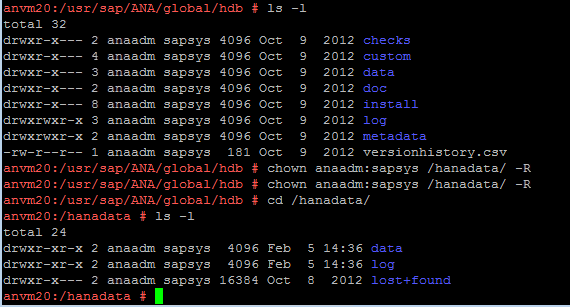 The original files can be removed/deleted after verifying HANA is up and running using the new file location. because I didn’t use the –p switch in my copy command, so the files took the root permissions. I am including to show what will happen if <sid>adm doesn’t have write permissions to the data or log files.